Abdelaziz Bouteflika's victory in the Algerian presidential elections is a remarkable achievement for a man who spent nearly two decades in the political wilderness. The 67-year-old veteran of Algeria's war for independence from France served as the country's foreign minister for 16 years until 1979. His upper-class, Westernised style led him to be called "the dandy diplomat" in some quarters. It marked him out from the other leading figures of the ruling National Liberation Front (FLN) and served him well in international circles, although his views were often contrary to Western interests. But after the death of President Houari Boumedienne, his fortunes waned, and he went into self-imposed exile in 1981 to escape corruption charges that were later dropped. He returned to Algeria in 1987. The following year, he signed a protest against alleged brutality by government troops towards youthful protesters, amid the first stirrings of the unrest that eventually led to a decade of violence. 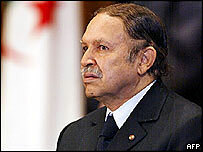 Mr Bouteflika returned to the political stage in 1999, when he stood for the presidency with the backing of the army. He was originally one of seven candidates, but the other six pulled out, protesting that the vote had been rigged in Mr Bouteflika's favour. Many saw him as the leader who could resolve the country's lingering civil conflict, which had erupted after the army intervened to prevent an Islamist victory in the 1992 general election. Just five months after he took office, he won overwhelming endorsement for a reconciliation plan that granted amnesty to thousands of Islamists. Western countries welcomed the amnesty and he transformed Algeria's image internationally, becoming a frequent visitor to Paris and Washington. As a result, he is widely credited with having restored peace to the country - and despite renewed allegations of ballot-rigging, many Algerians clearly felt he deserved another term in office.